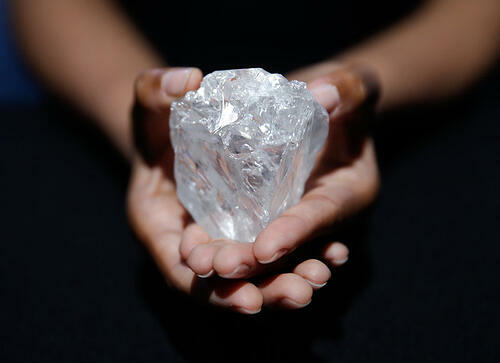 Starting our list at number 5, we have the giant Lesotho Legend weighing in at 910 carats. To put this into perspective, the stone is about the size of 2 golf balls. This gem is the largest ever produced by the Letseng mine in Lesotho, but its size is not the only thing that made the rough stand out. When graded by the GIA, the diamond was found to be exceptional quality featuring a D Color grading (the highest grade possible for a colorless stone) and a Type IIa clarity score (meaning there is little to no nitrogen inclusions.) The Lesotho Legend went on to fetch $40 million during the March 2018 Antwerp Diamond Tender. A very respectable price was paid by Gem Diamonds Ltd. a renowned mining company, which also gave this remarkable rough its name. Number 4 on our list is the breathtaking Star of Sierra Leone. Originating from the Diminico mine in 1972, this gem weighs in at 968.9 carats and is the largest rough to have ever been discovered in the alluvial deposits of Sierra Leone. Shortly after its discovery, the rough was said to have been sold to Harry Winston for under $2.5 million. From there, the gem was transformed into a still massive 143.2 carat, emerald cut diamond, but due to an internal flaw, it was decided to recut the stone shortly after. The Star of Sierra Leone would ultimately be divided into 17 separate diamonds, 13 of which being deemed flawless. The largest resulting piece weighed 54 carats, and the 6 highest quality gems were eventually gathered to create the famous Star of Sierra Leone broach. At number 3, tipping the scales at 995.2 carats, the Excelsior Diamond held the title for the largest diamond ever to be found from 1893 to 1905. Originating from the Jagesfontein Mine in the Orange Free State of South Africa by a worker shoveling gravel, the G Color giant was never sold despite its significance. This was thought to be due to its massive size and quality, far surpassing what any potential buyer of the time could afford. The diamond was ultimately sent to Amsterdam in 1903, where it would be cut into 10 smaller gems. 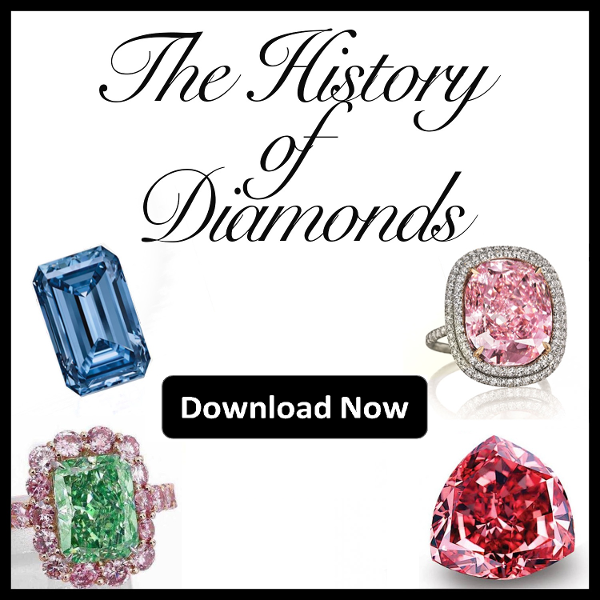 This decision was characterized by the manager of De Beers as "the greatest tragedy of modern times in the history of famous diamonds” simply because a stone of such caliber would never live up to its potential of being a massive faceted stone. The largest product of the rough was known as the Excelsior I, weighing in at 69.68 carats, and sold for $2.64 million during 1996. 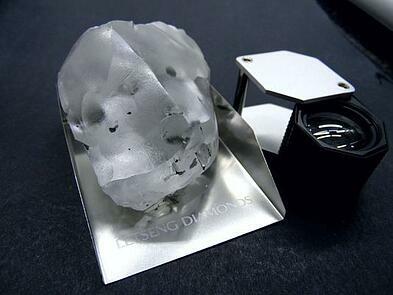 Weighing an astounding 1,109 carats, the diamond is the size of a tennis ball. Initially, the stone could not be valued; due to its colossal size, it was unable to fit into conventional scanners. Many experts were able to value the stone between $40-$60 million. The rough was ultimately purchased in 2016 by Laurence Graff for a very respectable $53 million. If 1,109 carats sounds like a mammoth size for a diamond rough, then the Cullinan is a titan, well deserving of the number 1 spot. 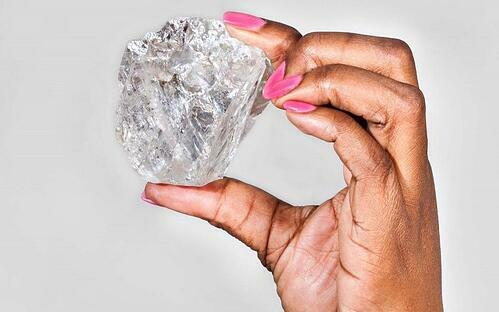 This colossal 3,106 carat rough was found in the Premier Diamond Mines in South Africa, just 30 feet below the earth’s surface, and was freed up with a simple pocket knife. The diamond would eventually be gifted to King Edward VII during 1907 by the South African Republic. It was during that time, that the decision to cut the stone into smaller pieces was made. This monumental task was assigned to none other than by Mr. Asscher (of I. J. Asscher & Co.) It is said that the diamond was so massive, the original steal cleaver blade that was used shattered, all the while leaving the stone completely unharmed. The Cullinan would ultimately be divided into 9 large and 100 smaller gem quality pieces. 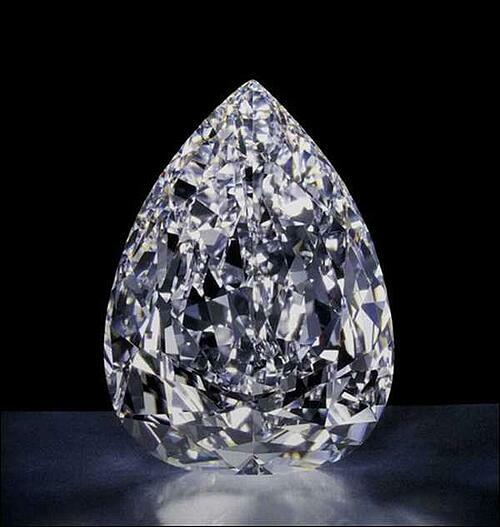 The largest diamond product of the stone is known as the Cullinan I (530.20 carats) which has been set in the Sovereign’s Scepter while the second largest; the Cullinan II (314.4 carats) was set in the Imperial State Crown. And there you have it, history’s top 5 most massive diamonds. Was there a stone we missed? Do you have any questions? Let us know! And as always, feel free to follow us on Twitter and LinkedIn!